Above all else, this extensive double live album, is a resume of Siena Root's early years. This album features all the elements of the band, from their debut up to recent days. They have managed to pour the bands dynamic energy from the stage right into this box of 91 minutes root rock. You will for sure find the good old heavy riffs, side by side with psychedelic vibes and groovy jams. But there is more, much more to experience in this magnificent album. There are no less than 9 guest artists featured, with a range from classical violin by Martin Stensson from Swedish radio symphonic orchestra, to legendary blues guitarist Maxi Dread. You will also find a lot of Siena Root family from the past such as Tängman and vocalists Oskar and Sanya performing songs on a new level. On top of it all you get previously unreleased material and 2 rare acoustic tracks that reveal a new side of the band. 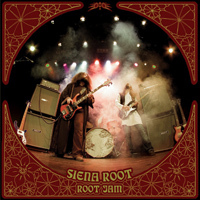 Root Jam is the album that covers the whole colorful spectra of Siena Root, and it's all straight from the stage. No overdubs or studio takes what so ever. If you are into tunes from late 60s, early 70s, you should get your hands on this album. The album will also be released on LP by Headspin Records.